Get ready for the hyper battle DVD event of the year as the latest issue of Terebi-Kun reveals the information about Emu's newly acquired Gashat, the Knockout Fighter 2! 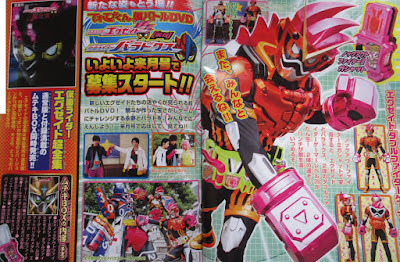 In the upcoming special, Emu will get hold of the new Double Gashat and power-up into Kamen Rider EX-AID Double Fighter Gamer Level 39. 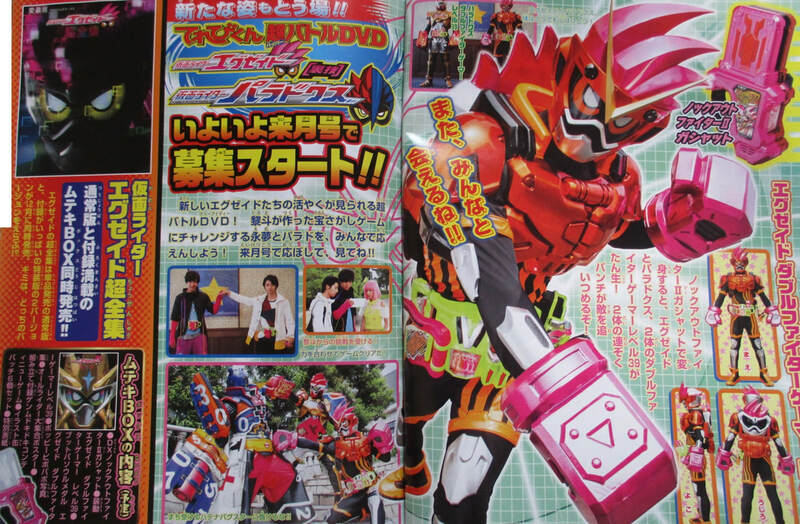 But wait, here is the interesting part: not only Emu but Pallad can also access the powers of the Knockout Fighter 2 Gashat which will enable him to transform into Kamen Rider Para-DX Fighter Gamer Level 39 (in which he wears the same suit only difference is he has a Gamer Driver. Is there a pun that involves the 39 or it's just a random number the choose? Maybe they're saying thanks? Cuz 3 is San and 9 is kyu. "San Kyu?" = "thank you?" This is just a guess. This is my theory about the Level 39 thing, especially admit makes no sense why Pallad would not use the Gashat Gear Duel when it is naturally stronger and is his default. I think the Bugster or the will lockout all 'Level 40 and up' forms, you know a reference to level requirement missions in games? I don't see any references but both of them using the same gashat to get level 39 is esentially MBXX's upgrade and KOFighter's downgrade. Together they are level 78 just like how each Double action gamer is a level 10.